The failure of the US government to close the detention facility at Guantánamo Bay is leaving a toxic legacy for human rights, Amnesty International said on the 10th anniversary of the first detainees being transferred to this notorious US prison. In a report published ahead of the anniversary, Guantánamo: A Decade of Damage to Human Rights, Amnesty International highlights the unlawful treatment of Guantánamo detainees and outlines the reasons why the detention centre continues to represent an attack on human rights. “Guantánamo has come to symbolize 10 years of a systematic failure by the USA to respect human rights in its response to the 9/11 attacks. 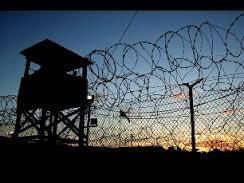 The US government disregarded human rights from day one of the Guantánamo detentions. As we move into year 11 in the life of the detention facility, this failure continues,” said Rob Freer, Amnesty International’s researcher on the USA. Despite President Obama’s pledge to close the Guantánamo detention facility by 22 January 2010, 171 men were being held there in mid-December 2011. At least 12 of those transferred to Guantánamo on 11 January 2002 were still held there. One of them is serving a life sentence after being convicted by a military commission in 2008. None of the other 11 has been charged. The Obama administration – indeed large parts of all three branches of the federal government – have adopted the global “war” framework devised under the Bush administration. The administration asserted in January 2010 that four dozen of the Guantánamo detainees could neither be prosecuted nor released, but should remain in indefinite military detention without charge or criminal trial under the USA’s unilateral interpretation of the law of war. “Until the USA addresses these detentions as a human rights issue, the legacy of Guantánamo will live on whether or not the detention facility there is closed down,” said Rob Freer. The Guantánamo detention facility, which is located on the US naval base in Cuba, became a symbol of torture and other ill-treatment after it was opened four months after the 9/11 attacks. Among the detainees still held there today include individuals who were subjected by the USA to torture and enforced disappearance prior to being transferred to Guantánamo. There has been little or no accountability for these crimes under international law committed in a program of secret detention operated under presidential authority. The US government has systematically blocked attempts by former detainees to seek redress for such violations. In 10 years, only one of the 779 detainees held at the base has been transferred to the USA for prosecution in an ordinary federal court. Others have faced unfair trials by military commission. The administration is currently intending to seek the death penalty against six of the detainees at such trials. The Obama administration has blamed its failure to close the Guantánamo detention facility on Congress, which has indeed failed to ensure US compliance with international human rights principles in this context. “Under international law, domestic law and politics may not be invoked to justify failure to comply with treaty obligations. It is an inadequate response for one branch of government to blame another for a country’s human rights failure. International law demands that solutions be found, not excuses,” said Rob Freer.